The mandate for the BC Cowboy Heritage Society is to Promote and Preserve Cowboy Heritage in the Province of British Columbia. To help accomplish this, a new award was started in October 2006 in memory of the late Joe Marten. It is to be awarded to someone who has been influential in the promotion and/or preservation of Cowboy / Western Heritage in the Province of BC. Nominees must be, or have been, a BC resident and material must be BC related. A nominee does not have to be a working cowboy (working cowboys should be passed on to the BC Cowboy Hall of Fame). Nominees must be, or have been, influential in the promotion and/or preservation of cowboy / Western Heritage in the Province of BC. 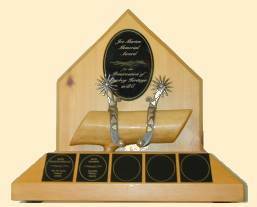 There is a committee, formed by the BC Cowboy Heritage Society, that will go through the nominations and select the best choice(s) to receive the Joe Marten Memorial Award each year. The committee will report back to the BCCHS, with their decision for approval. Until we get a sponsor, funding for the award costs (plaques, engraving, etc) will come from the BCCHS with a portion donated by Traudl Marten. Click on this button to find a nomination form.